Hays, Kansas – Feb 25, 2015) – As one of only a few orthopedic surgeons between Kansas City and Denver that performs specialized spine techniques, Vivek Sharma, M.D., treats a wide range of back-related conditions. Dr. Sharma, an orthopedic surgeon at the HaysMed Orthopedic Institute, is specially trained in MIS, which stands for minimally invasive spine surgery. In addition to the Orthopedic Institute, Dr. Sharma also sees patients in outreach clinics in Colby, Great Bend and Larned. Some patients seek Dr. Sharma’s advice for nagging back pain. Others have had more traditional spine operations with negative results. And still others have sciatica, compression fractures or other issues. MIS benefits include: a small incision; preservation of muscle tissue; less blood loss; fewer blood transfusions; shorter hospital stays; less post-operative pain; faster recovery; and lower infection rate. “We want to deal with the misconception that back surgery is a last resort,” Dr. Sharma said. “People think ‘this is the last thing I do before I go to the grave; I’ll be in bed six weeks.’ These things are not true. Those who have had unsuccessful traditional spine operations may benefit from MIS, Dr. Sharma commented. Virtually anyone is a candidate for MIS; Dr. Sharma has performed it on patients ranging in age from 16 to 102. Of the more than 500 procedures he has performed in his five years at HaysMed, 90 percent involved MIS. While HaysMed does not require referrals, some insurance policies require pre-approval. Dr. Sharma follows standard work-up procedures. Dr. Sharma noted that spine treatments could be outlined on the shape of a pyramid. At the base are those who need only physical therapy and anti-inflammatories; patients in the next area might need injections for pain management. Most people are hospitalized one or two nights after MIS and virtually all are up and about by the next day. Many don’t require a brace. In addition, HaysMed conducts spinal monitoring during the surgery. A registered nurse watches a computer monitor and informs the doctor of any safety concerns. “For example,” Dr. Sharma said, “the nurse might say there is no problem but that I am getting closer to a nerve. 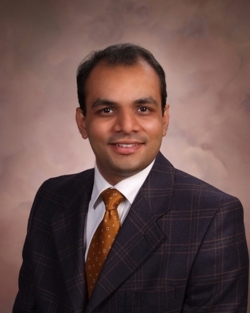 Dr. Sharma earned his medical degree, and performed his rotating internship and residency at G.S. Medical College and K.E.M. Hospital at the University of Mumbai in Mumbai, India. His orthopedic residency was at the same university.